Dynamic Design and Manufacturing, Inc., provides precision welding services as part of our full suite of metal fabrication services for our clients worldwide. We offer precision welding services for a variety of industries and applications, specializing in telecommunications, process control instrumentation, medical, aerospace, and national defense applications. We have expertise welding a variety of materials, including stainless steel, carbon steel, aluminum, nickel alloys, and titanium alloys. Our expert engineering, production and welding staffs are supported by our company-wide commitment to quality and customer satisfaction. At Dynamic Design and Manufacturing we are proud of our reputation for manufacturing the highest quality precision metal parts that meet or exceed our customers’ expectations. 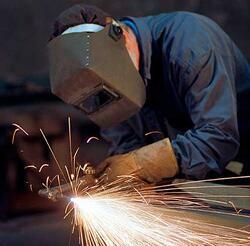 Dynamic Design and Manufacturing offers MIG and TIG welding as a secondary service for our customers. Metal Inert Gas (MIG) welding, also known as Gas Metal Arc Welding (GMAW), is a welding process in which an electric arc forms between a consumable wire electrode and the workpiece metal, which heats the workpiece metal and causes them to melt and join. Tungsten Inert Gas (TIG) welding is an arc welding process that uses a non-consumable tungsten electrode to product the weld. Our welding services are integrated with the machining, laser cutting, punching, rolling, hardware installation, and finishing processes required to efficiently manufacture your parts. We serve clients worldwide, providing custom finished parts that meet your specific requirements and tolerances. Of all the metals that can be TIG welded, aluminum is perhaps the most popular choice for the process. Aluminum hosts a number of advantageous features, such as its high strength-to-weight ratio, corrosion resistance, malleability and heat conductivity, among many more. Some of aluminum’s characteristics, however, require that it be welded with extra care and attention. Rest assured, we’re able to handle a wide variety of materials, and aluminum is no exception. Our extensive experience, advanced machinery and superior skills allow us to exceed our customers’ expectations every time. Our Niwot, Colorado facility is equipped with state-of-the-art equipment and technology, providing efficient, precision manufacturing capabilities. With 31,000 sq. ft., our facility has the capacity to produce quantities from prototype through high-volume production runs, and to efficiently fabricate and finish your part. Our engineering staff can work with you to achieve the most cost effective design for manufacturing and our experienced production and welding staff will manufacture your parts to meet your specific requirements. Dynamic Design and Manufacturing is ITAR compliant and our manufacturing processes are ISO 9001:2015 certified so you can be assured that your welded parts will meet or exceed the quality and workmanship you require.